Hp1γ (CBX3) associates with euchromatin and is largely excluded from constitutive heterochromatin (1). CBX3 recognizes and binds histone H3 tails methylated at 'Lys-9', leading to epigenetic repression (2). It seems to be involved in transcriptional silencing in heterochromatin-like complexes. May be associated with microtubules and mitotic poles during mitosis (2). Recombinant human N-terminal His tagged Hp1γ was produced in E. Coli, purified using FPLC and formulated in a storage buffer containing 20mM Tris-Cl pH 7.6, 1mM EDTA, 0.15 M NaCl, 10% glycerol, 0.5mM PMSF and 1mM DTT. Protein concentration was determined by spectrometry. >98% purity by SDS-PAGE. Each lot has been evaluated by 10% Tris Glycine SDS-PAGE. 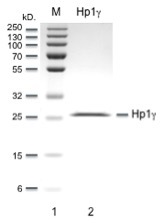 SDS-PAGE gel of recombinant Hp1γ (Lane 2). Lane 1, protein molecular weight marker. For research use only. Products guaranteed stable for 2 years from date of receipt when stored properly. >98% purity by SDS PAGE. 2. Lachner et al., Nature 410:116-120(2001).